Refreshening exhibited at the Pro-Hair Live Manchester 2014 promoting the fantastic Professional Barbers Cleansing Wipes. These individually wrapped cleansing wipes went down a storm at the show as hundreds of barbers showed great interest with many orders placed. Designed to cleanse and fresh clients by removing loose hair trimmings after every haircut. The response from barbers was a great product together with a great price too. 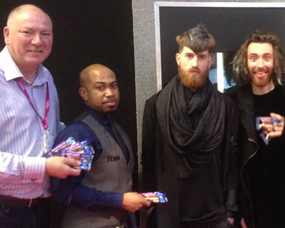 Refreshening are again exhibiting at the 2015 Pro Hair Live (8th – 9th March, Stand C32) come and see us there… Pictured with ‘Refreshening’ Director Paul Woodward is Chris Foster from the Foss Academy.